A FUN bootcamp style class that is sure to a make you SWEAT! Cardio, Core, Kettlebells, Slam-balls, Prowler pushes, body weight and more to help you become, STRONGER, FASTER, AND HEALTHIER! Sorry, no barbell work for this class! This is for ALL fitness levels, young and old! We can modify or scale to your ability so YOU get the best workout! 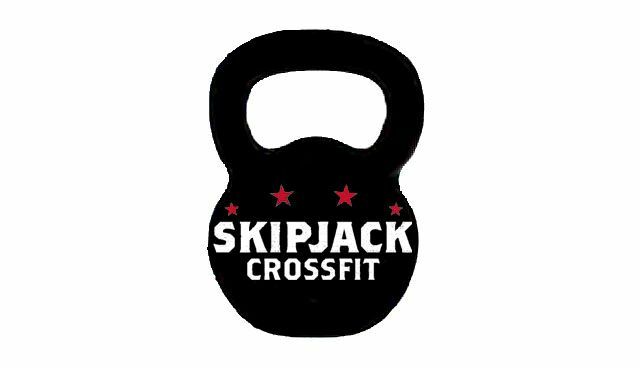 SKIPJACK CROSSFIT OFFERS CLASSES THAT ARE BOTH FUNCTIONAL AND FUN! CrossFit and Striking for our adults and Crossfit Kids for our kids and teens. Anyone is welcome to try any class for free. Come by and pick a class! The Striking class teaches you how to increase overall fitness, core strength, rotational speed & power by incorporating striking drills into CrossFit workouts. CrossFit Kids/Teens is a fun, all-inclusive fitness program geared towards elementary to high school aged kids. It’s a great way to learn to love fitness! SWEAT is a boot-camp class for all skill levels and ages. With a focus on cardio and body weight exercises, you’ll definitely break a SWEAT! Mai, Grace and John are amazing and dedicated coaches who put the growth and progress of their athletes first. Mai tailors her coaching to fit my individual needs, follows up with encouraging texts, and provides friendship in general. I always feel so motivated by the coach and the group I'm working out with. You can't compare this place to a regular gym! The coaches' passion is so contagious and the togetherness of this community is strong, like their hamstrings! They were extremely accommodating and sincerely dedicated to teaching the proper form and techniques of some of the advanced lifts. I have been coached by Mai for over a year now and STILL get excited by what she will empower us to do each class. Striking, lifting, CrossFit - it's addicting!